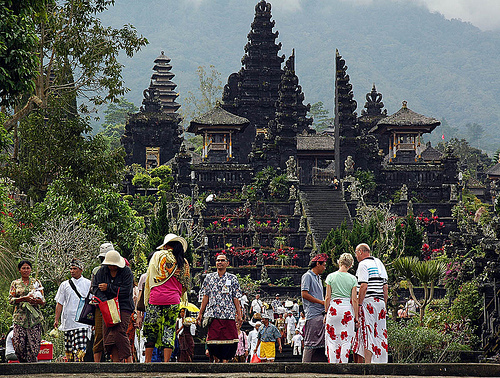 If you use a car or join any four wheels vehicles to the Besakih temple from the Airport will take approximately two – half hours drive to the east of Bali. Besakih temple’s area is vast, if you wish to explore more about this Besakih temple, you may have spent about 1 hour to get around in the area adjacent to the place. The attractions that located near the Besakih temple is famed site rafting, a water rafting that take place at Telaga Waja River. Including Besakih temple in your Bali Holidays plan is a must, because you will find a lot of Balinese people here wearing Hindus uniform and a lot of attraction like Barong dance, mask dance, puppet show and much more. Besakih Temple’s complex consists of one center is called Pura ( temple ) Penataran Agung Besakih and companion by 18 temples which is 1 Basukian temple and 17 Other small temples. All Hindus especially in Bali, has a temple penyungsungan (praying place) called Pura Pedarman according to their dynasty, which is a heritage from generation to decline. Penataran Agung ( the greatest praying field ) is the largest temple in the complex of Besakih Temple, the temples are much more than others, the ceremony also most in the region's Penataran Agung ( great field ). Here there are 3 main temples which are the sacred essence and symbolized the whole building in Besakih Temple. Padmasana-Tiga ( three ) is a symbol of God in accordance with the nature place of Tri Murti, namely Brahma the Creator god, Vishnu the Preserver god and Shiva as the fuser god. Besakih Temple comes from a very old age, because of the many megalithic relics, such as stone throne, pyramid patio structure found in the complex of Besakih Temple. What we get in Besakih Temple ? Visiting Besakih temple providing a strong spiritual feel, completed with spread of the natural landscape of the height which make it looks so beautiful. Especially if you get the Dark Temple occupies the top position in the temple complex. 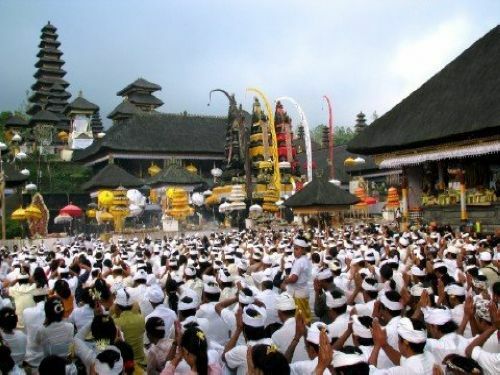 If you are a tourist and will pay a visit to the temple area, you must be accompanied by a guide / local guide, they set up a tour for a regional organization of Besakih area and for their services, will be charged extra about USD 5 – USD10, depending on the number of participants.